What's your putting number? 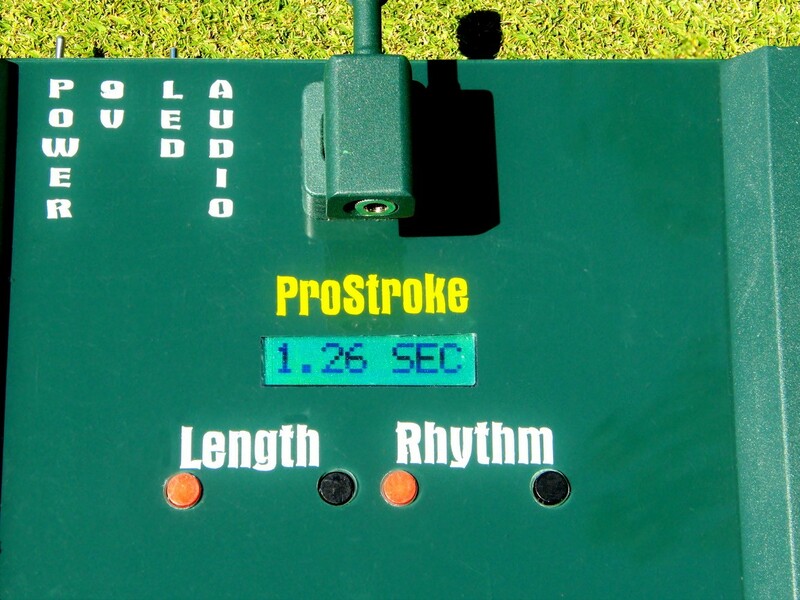 Everyone has a "timing number" in their putting stroke. The easiest way to identify your "current" putting number is to turn ON the power switch and stroke the putt. 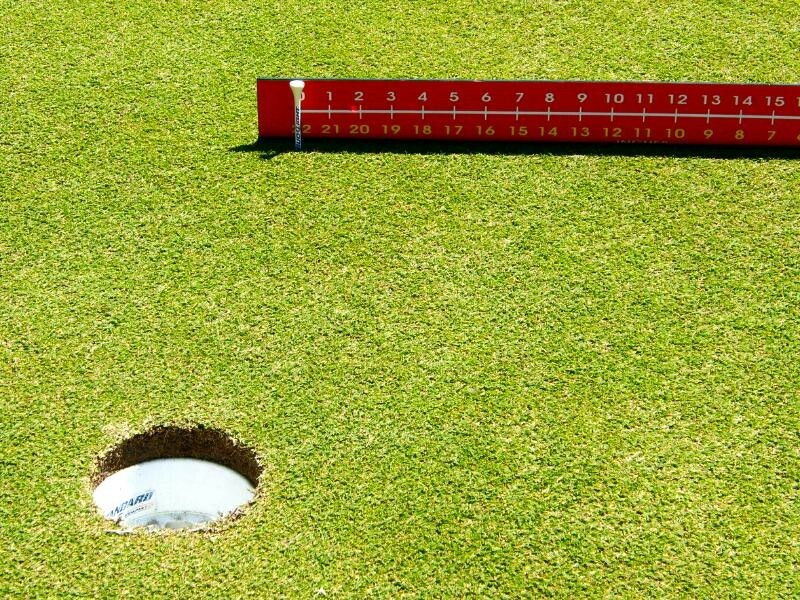 Take the average of three putts to find your current rhythm. The LED screen times your stroke to within 1/100th of a second when the power is ON. Use this timing rhythm LED feature alone or with the rhythm, and visual features! ​​To match your stroke's rhythm with the LED screen adjust the RHYTHM shown in the LED screen to match your NUMBER. To speed up your stroke's rhythm, REDUCE the time, by pushing the RHYTHM'S black button down until you reach the number that matches your setting i.e; the picture to the right. To allow for a longer back swing push the red button down and hold it until you have reached your desired length. The RED lights on the railing system will indicate the putters backswing setting when you finish. With just two adjustments you have set the rhythm and stroke's length of YOUR putting stroke to match the putt you intend to practice. Fine tune your putting stroke's rhythm and length to fit the putt you're practicing. Don't be afraid to adjust these features. Every player has their own sense of timing and is unique. Note: The LED screen will reset itself when you sole the putter behind the ball and the RED light, located on the railing system. This ONE RED light will turn ON when The ProStroketm is ready for you to putt. 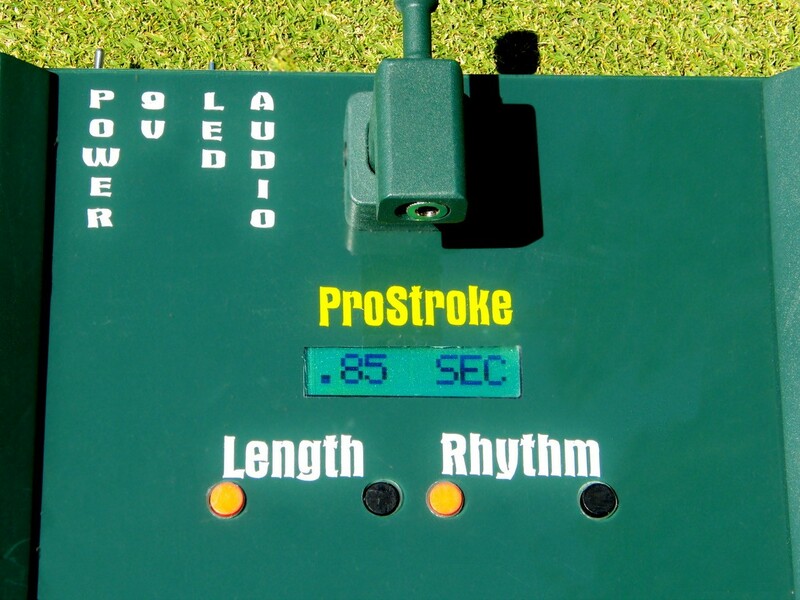 REMEMBER, the strobe light on The Nside10 Prostroketm rails moves in relation to: (1) the stroke's length, (2) the putter's over-all pace or rhythm, (3) while the LED timing number reads & matches your stroke's timing, & (4) the visual rhythm represented by the strobing lights. Picture (B) is showing you how to accurately set the RED target for ball speed control at the cup. 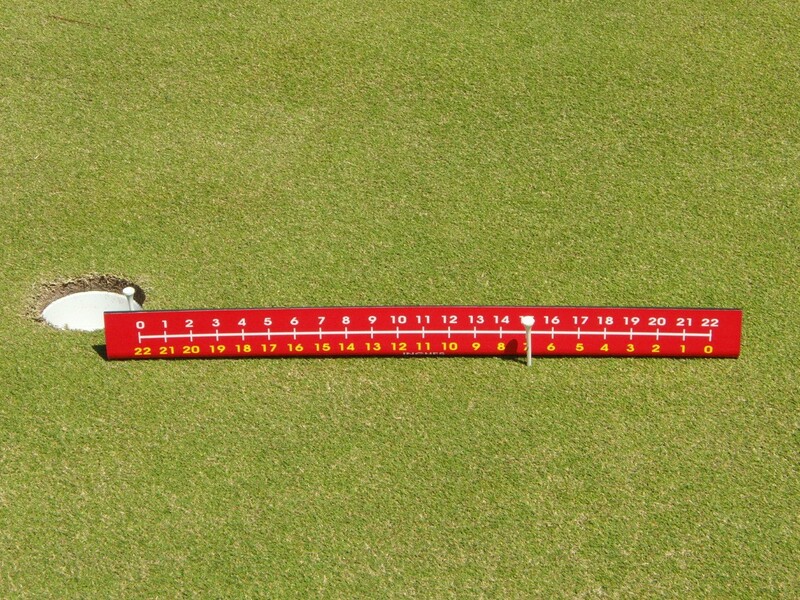 The further you set the target behind the cup the more aggressive your putting will become when practicing. The optimum speed to roll the ball is 15" to 17" beyond the cup to maximize sinks, per Dave Pelz. ​​Note: ​​When you're practicing straight putts move the RED target directly behind the center of the hole (#11), and push the RED target away from the back of the hole the desired distance you want the ball to roll if you miss the putt. A 2" break is pictured above & 15" ball speed distance has been chosen in the second picture.